As you can tell from the position and date lines above, we have made two significant moves this week. One was our crossing of the International Dateline. We are now a day ahead of you. That means I actually celebrated my birthday twice this year- on its actual date. Thankfully I didn't have to age another year. The second was our crossing of the 180 degree line of longitude. This is halfway around the world from the Greenwich o degree line of longitude. In other words, those boats which left Gibraltar have now travelled halfway around the world. We are so far west we are now EAST! 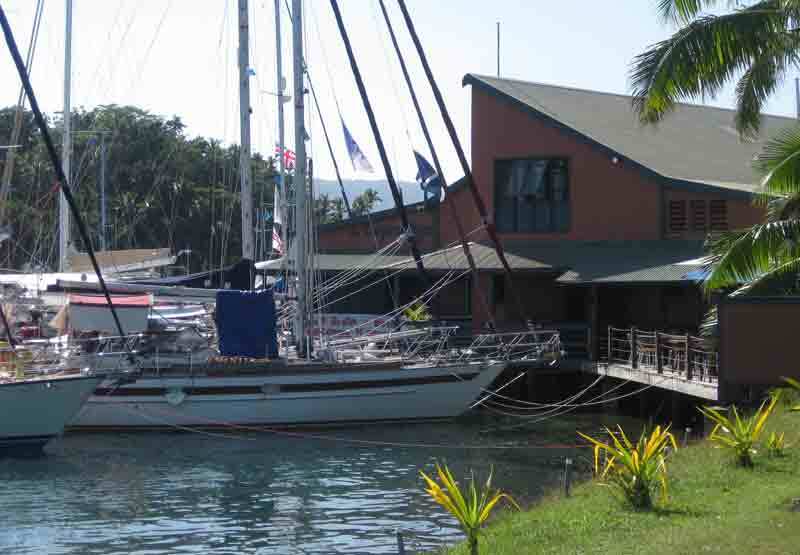 Despite "putting on the brakes" the last two days of sailing we were still too early in arriving at Suvasuva in northern Fiji. There are many reefs and we had not been at the briefing for arriving in Fiji so didn't have the waypoints for an overnight anchorage. Therefore, we had to sail around in the channel from 11:00 pm until 7:00 am in order to enter the river leading to Suvasuva. There was a magnificent sunrise that morning and we had no problems picking up a mooring in front of the Copra Shed marina. We then awaited visits from the Health Department and from Customs and Immigration. It was very convenient that the officials came aboard the boats- but it meant a very hurried housecleaning after a week of being buffeted about by the sea. The Copra Shed Marina really is a restored copra shed. 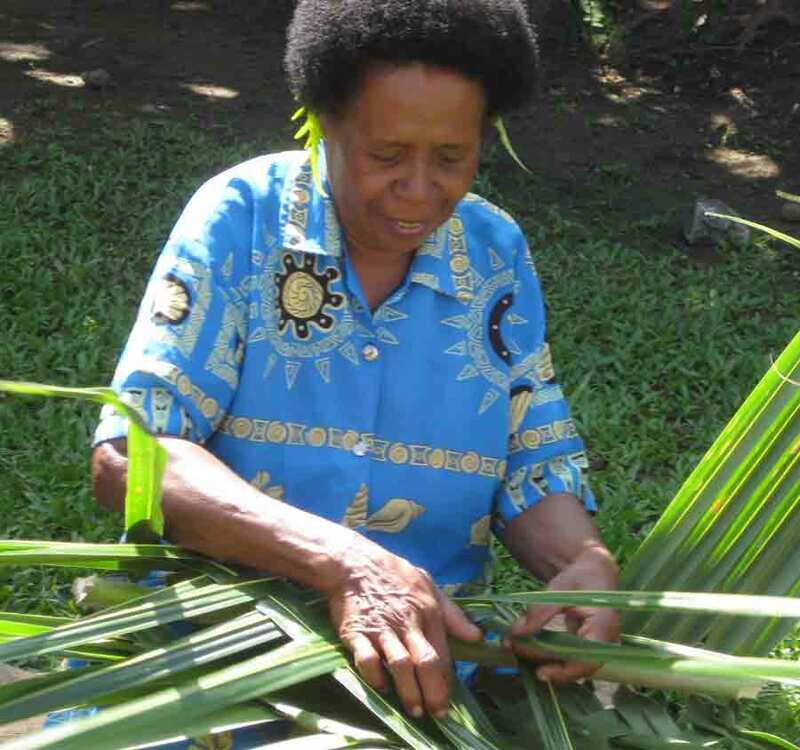 Copra has been one of the major industries in the South Pacific. Coconuts are grown and processed into the dry coconut meat (copra) and the oil is used for the manufacture of soaps and medicines. The coconut milk is used for cooking and the coconut water for drinking. The dry husks are used for fuel for cooking fires. Thereafter the sun decided to disappear and we were all confined to quarters for a few days. This was NOT the Fiji we were hoping for. Hopefully we signed up for a rainforest tour on Monday, figuring we may as well get wet in a rainforest as on the boat. 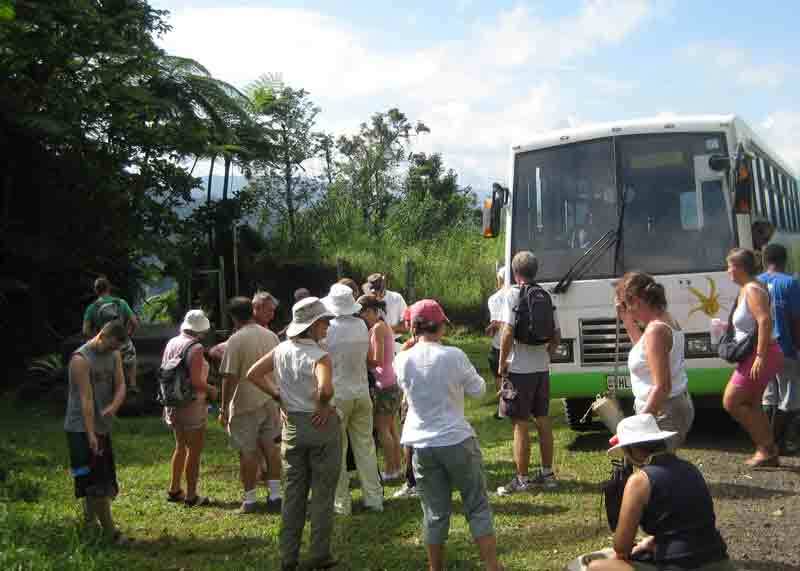 The brochure promised a three-hour trek through the forest, observing several types of endemic birds. Monday dawned lovely and sunny. We became a little uneasy when the local firehall was pointed out as an attraction. We did have a lovely bus ride (on a school bus with "natural" air conditioning). We finally alighted and sprayed on our DEET ready for the hike. About fifteen minutes later we arrived at a waterfall. Then, unexpectedly, we turned around and hiked back to the bus. Fine, we expected to hike at another spot. This was not to be. Instead we drove back to town! Apparently a cyclone has made the rainforest impenetrable and dangerous and we could not visit it! 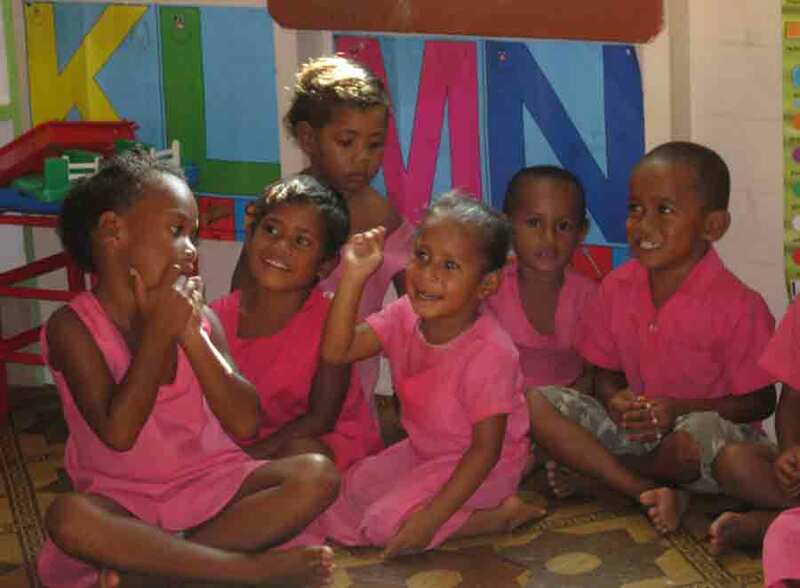 Eventually the tour operator refunded part of the fee, which we donated to the local boating club for the children. But it certainly was the tour that wasn't! That (and the rain) has really been the only down part of our stay here. The people are fantastically friendly and helpful. Eating in restaurants is very inexpensive and the entertainment provided (especially the band on Saturday night and at last night's BBQ). Everyone has had a great time. For us it is wonderful to be back with the rally after nearly two months away. The first night here was a welcome kava ceremony. 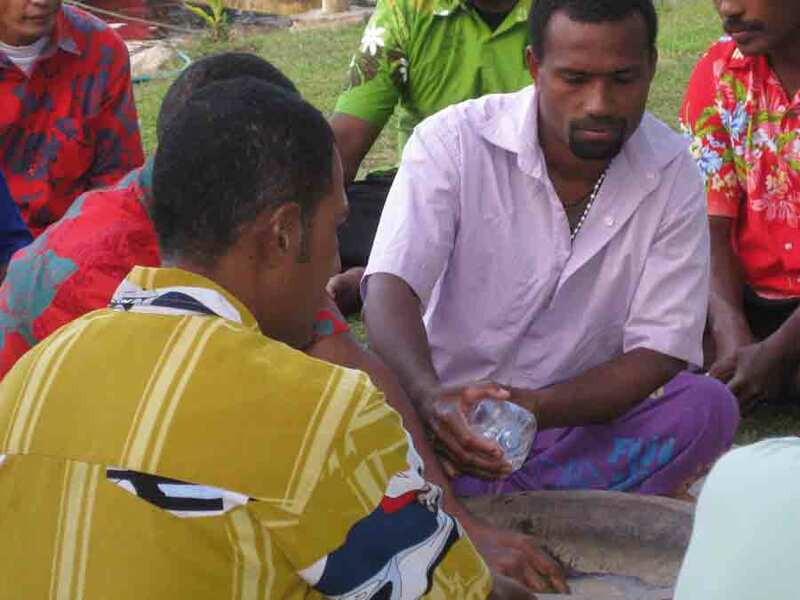 Kava or yaqoni is made from the root of a member of the pepper plant family. 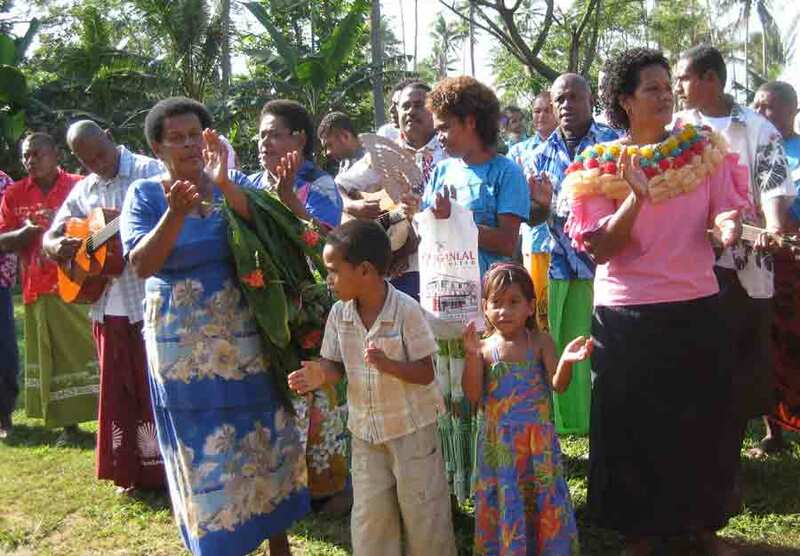 Gifts of the root are presented to villages where one visits. The ground root is mixed with water and a very specific ritual followed. The mixture is stirred and filtered through a piece of cheesecloth, while ritual words are spoken. The guest of honour is presented with the first coconut bowl full of the drink. The recipient claps once then drains the bowl with one drink. Everyone then claps three times and the process is repeated until everyone has a turn. Then it goes around again and again. 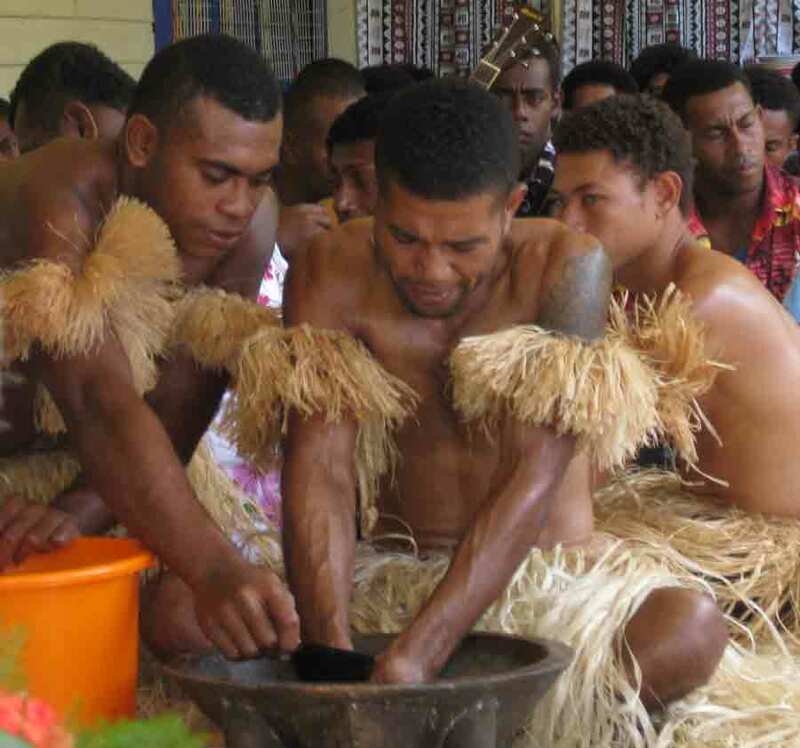 The kava has a mild narcotic and anesthetizing effect. It also looks and tastes like dirty dishwater. It is very difficult to keep a straight face while imbibing! Thank goodness it is mainly reserved for males! We were a little leery of Tuesday's visit to a local village, where the grand chief lives. Dave decided to opt out and to jerry jug fuel to the boat instead. However, it turned out to be a magical day. 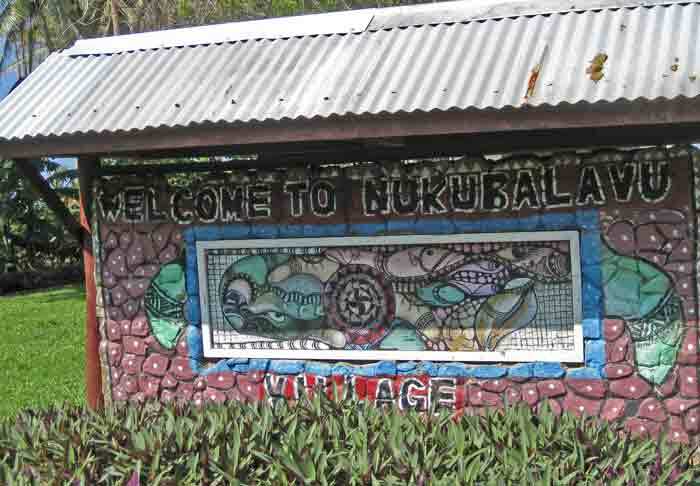 Once again we boarded a school bus and held our breath as the gears ground while climbing the steep hills to Nukubalavu. 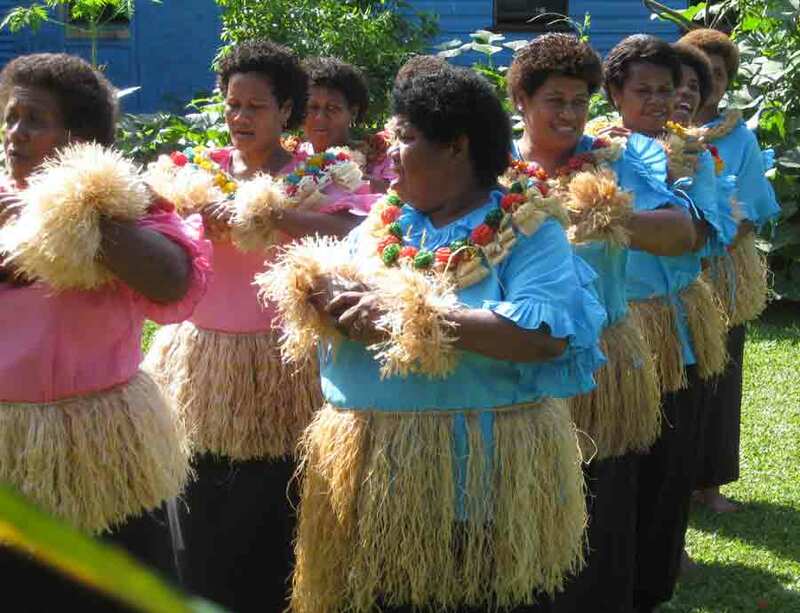 As we stepped out of the bus we were each presented with floral necklaces or collars while local people sang a lovely song of welcome (Bula) to us. The village was on the seaside. 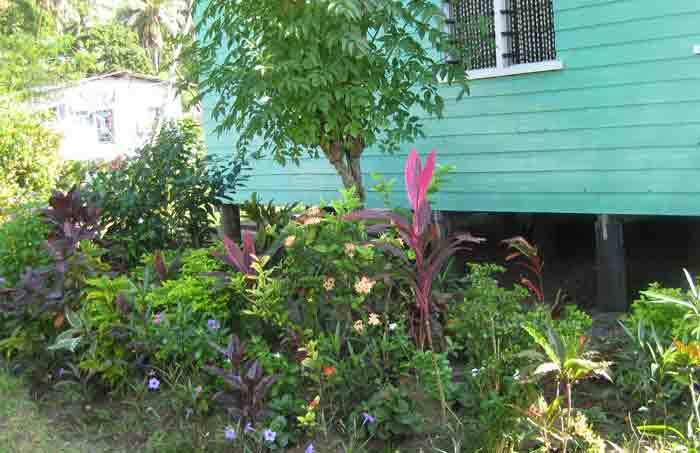 Everything was neat and clean and the people obviously took pride in maintaining their homes and gardens. Access to the sea provides fish and shells as well as the opportunity to cultivate pearl farms with their local golden pearls. The fertility of the soil provides excellent crops for food. It was a delightful place to spend the morning. 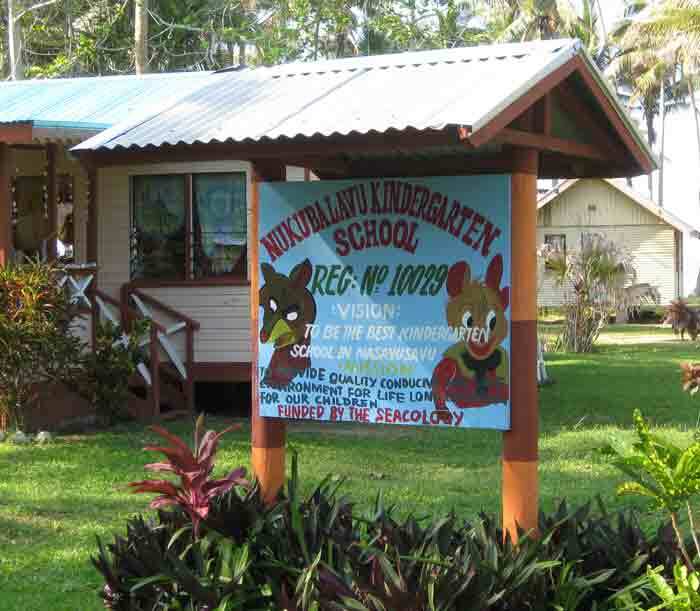 A very special place in the village- the local kindergarten. 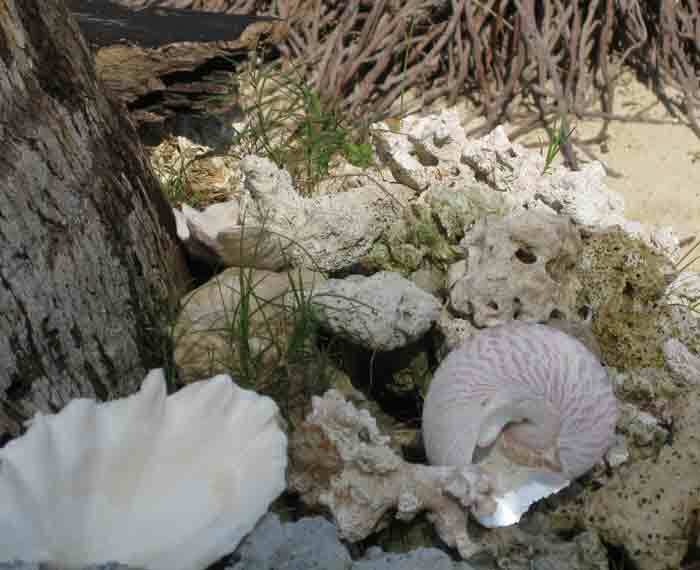 There were shells decorating the foot of each palm tree along the shore. There were beautiful gardens everywhere. The village is also building a new church as the older one has become too small. 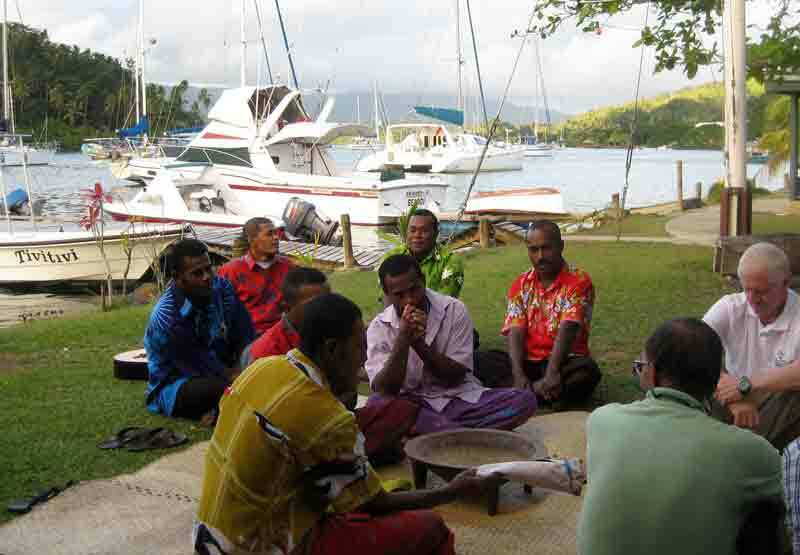 Once again the men in the group were encouraged to participate in a kava ceremony. This time they had to sample TWO bowls! 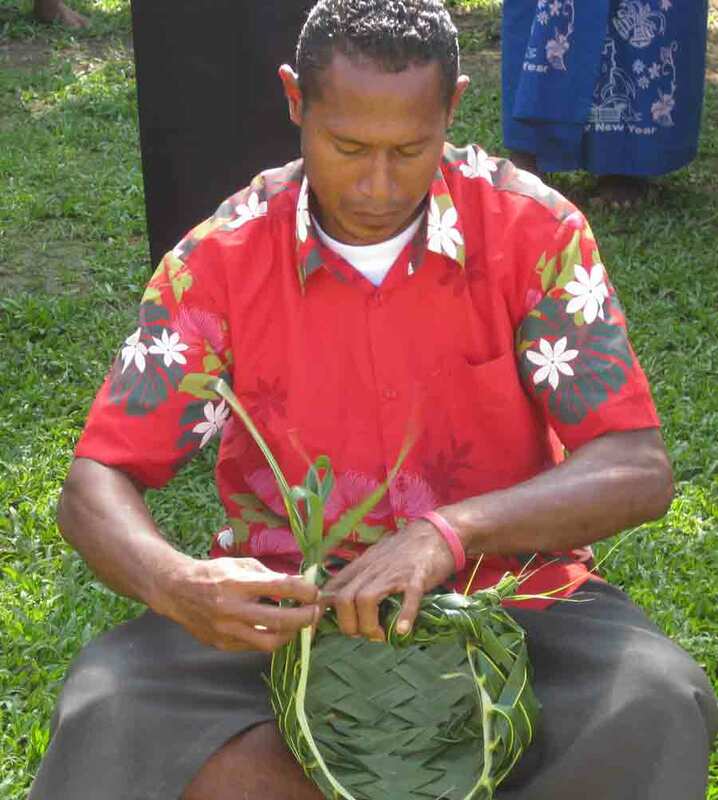 Next a woman and two men showed how they used a palm leave to manufacture baskets. The woman's basket was designed for collecting shell and the men's for transporting root vegetables from the plantations. Then coconuts were split and we each received some delicious coconut meat and some coconut water for a snack. Then we had the opportunity to shop choosing from the wide selection of well made jewellry, tapa cloths (made from bark) and carvings. As we left a farewell song was sung to us. It was really a memorable visit. Tonight is our last here in Fiji. We have had to say farewell to some wonderful friends as they are leaving the rally from Fiji. 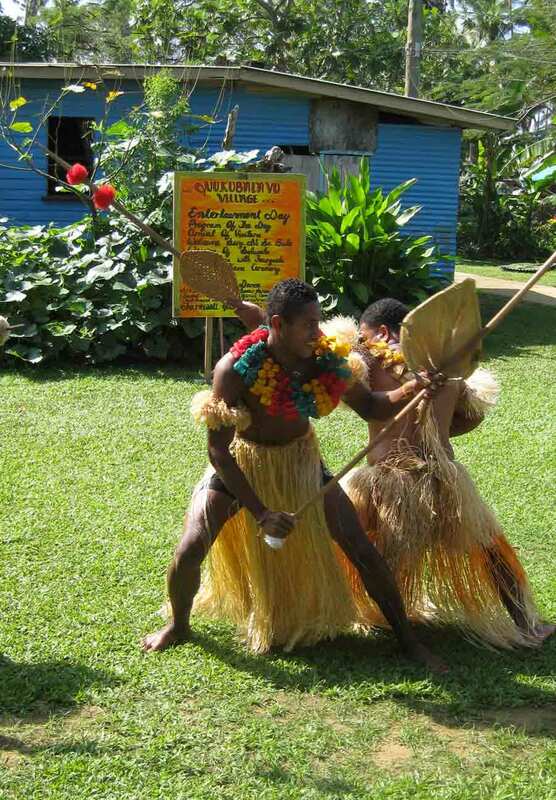 We will be missing the visit to Musket Cove Resort on the west coast of Fiji as dave and I would like to spend a little extra time in Vanuatu our last stop before Australia.